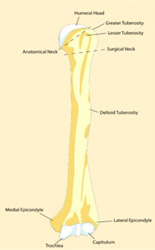 The humerus makes up the “ball” of the “ball-and-socket” shoulder joint. The lower or distal part of the humerus makes up the elbow joint with the radius and ulna. 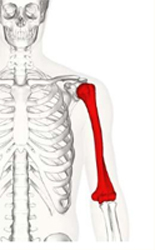 The name “humerus”comes from the greek omos, meaning shoulder. The humerus provides the attachment site for a number of different muscles and ligaments, forming and stabilizing the shoulder joint. The rotator cuff muscles, biceps, pectoralis major, teres major and latissimus dorsi tendons all attach to the humerus. 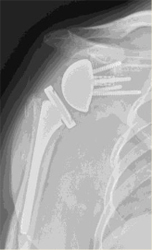 A proximal humerus fracture occurs when the ball of the ball-and-socket is broken. Proximal means “towards the beginning,” so the fracture has occurred at the beginning of the humerus bone. These fractures are the third most common geriatric fracture, typically occurring from a low energy fall. 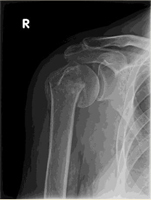 Proximal humerus fractures also present in ayoung population following high energy falls or crashes from activities such as mountain biking or riding a motorcycle. 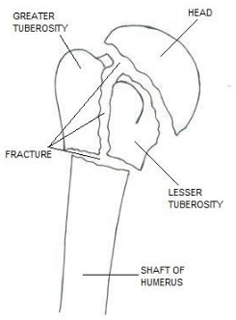 Most fractures are non-displaced or not out of position. 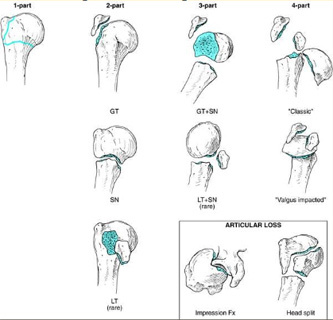 The Neer classification for proximal humerus fractures is used to describe fractures based on the number of bone pieces and displacement. Up to 85% of fractures can be treated non-operatively: typically non-displaced type 1 and 2s. The shoulder is immobilized in a sling for a period of 2-3 weeks. Range of motion exercises are started and as healing progresses more strengthening exercises can be incorporated. Full healing typically takes about 3 months. 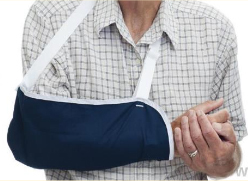 If the fracture is displaced, surgery may be necessary to realign or replace the bone. Important factors will include age, hand dominance, activity level, and degree of bone displacement. 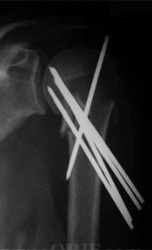 Operative treatment includes holding the bone fragments in place with a metal plate or percutaneous fixation- where pins are placed through the skin to hold the fracture in place until it heals. A shoulder replacement may be necessary if there are concerns about repairing the bone. Outcomes after treatment of proximal humerus fractures are somewhatdependent on the scale of the surgeon providing the care. Studies have shown that surgeons you routinely treat these problems have better outcomes than those who only treat proximal humerus fractures occasionally. 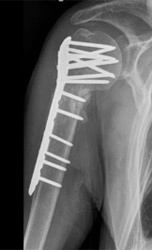 Surgical treatment of these injuries are complex and sometimes challenging and require carefully, meticulous technique to ensure that the best possible outcome can be achieved. Surgeon training and volume directly correlates to these variables.